A-list celebrities lined the court to pay homage as Red Hot Chili Peppers guitarist Flea played the national anthem. Some in the 18,000 sell-out crowd had paid upwards of $25,000 (£17,580) to be there. Kobe Bryant's 1,566th and final game for the LA Lakers, bringing to an end a career spanning two decades, was a big deal. The number of Most Valuable Player awards Bryant has won. The accolade given the best-performing player in a regular season, Bryant won it in 2007-08. The number of NBA Finals MVP awards won by Bryant, in 2008-09 and the following year. It is also the number of Olympic gold medals he has won, helping the United States to the top of the podium in 2008 and 2012. All-Star MVP Awards won - in 2001-02, 2006-07, 2008-09 and 2010-11. He is tied with Bob Pettit for the most in NBA history. Bryant has won five NBA championships - only one other current player has won as many (Tim Duncan of San Antonio Spurs). Just four players in NBA history - Bryant, Michael Jordan, Kevin Garnett and Gary Payton - have been selected for the NBA All-defensive first team nine times. And only one other player, Karl Malone, has ever made the All-NBA First Team selections 11 times. That is how many starts Bryant has made in the NBA's annual All-Star Game - the most in NBA history. And 16 is the number of times Bryant has played on Christmas day - again, the most in NBA history. As well as making 15 starts, Bryant has been picked for the All-Star Game 18 times in a row. That is the longest streak in NBA history and only Kareem Abdul-Jabbar, with 19, made the All-Star Game more times. No other player in NBA history has spent 20 seasons with just one club. Bryant is a Lakers man through and through. The number of games in which he has scored 50 points - only Wilt Chamberlain (118) and Michael Jordan (31) have scored 50-plus points more times. The number of points scored against Utah Jazz in his final game. It was only the seventh time he had scored 60-plus points and the first time he had achieved the feat since 2009. 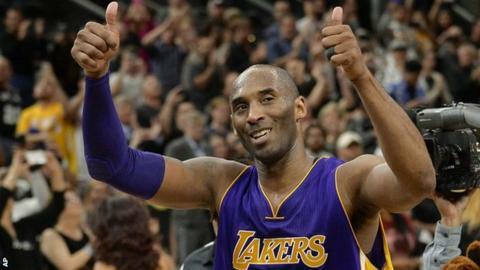 When the Lakers beat Toronto Raptors 122-104 on 22 January 2006, Bryant scored 81 of his side's points. Only Wilt Chamberlain, with a 100-point game in 1962, has scored more. Bryant's 5,640 points scored in the NBA playoffs is the third highest total in NBA history behind Jordan (5,987) and Abdul-Jabbar (5,762). Since his rookie season in 1996-97, Bryant has scored 33,643 regular season points, putting him third on the all-time scoring list behind Abdul-Jabbar (38,387) and Karl Malone (36,928). Only five other players have played more NBA minutes than Bryant. He was given 42 minutes in his final game - the most he has played since November 2014.